If you’re new here then do note that I’ve been keeping tabs on various camera rumours for several years and receive all kinds of of tips and rumours. Some are considerably more believable than others. A patent for a mirrorless, full frame 19mm tilt/shift lens appears (lenses page) with just 22mm back focus distance. There was a patent for a rather uninspiring 28-80mm f / 3.5-5.6 VR full frame mirrorless lens from Nikon last year, so they have form in this area. The Wireless unit is new, but I have to wonder who in Nikon felt the need to make such an announcement and why – perhaps of note is the lack of mention of a D400 or ‘pro’ APS-C DSLR? 29th The D5 now seems expected in early 2016. Are we close enough for specs [NR] to have a bit more chance of accuracy? Announcement expected in late 2015 or in early 2016. 11th Comments from Thom Hogan reflecting on cameras coming from Nikon – no signs of a D300s replacement at the moment. 25th Thom Hogan wonders about the missing D300s replacement [TH] and how it fits in the top end of Nikon’s lineup. Maybe a D500 to go with an upcoming D5 later this year? “The Nikon D810A provides hobbyists as well as professional stargazers with a powerful combination of impressive resolution and features specifically created for astrophotography and scientific applications. The infrared (IR) cut filter has been optimized to allow transmission of the hydrogen alpha spectral line, resulting in four times greater sensitivity of the 656nm wavelength. The resulting images capture the brilliant red hues of diffuse nebulae and constellations in striking detail and fidelity. While not recommended for general photography, the D810A is an excellent option for photographing the universe with either NIKKOR lenses or third-party adaptors for telescopes. How this differs from just making firmware updates available, as currently, remains to be seen. Of course it could could eventually be a mechanism to charge for some updates, or just as another way to maintain contact with camera users. 5th We were told of rumours circulating at Photokina that both Canon and Sony were close to introducing stacked (multilayer) pixel sensors in products next year (see main rumour page). There has been a steady stream of patents over the years, but no sign of such sensors other than from Foveon/Sigma. The Sony comment actually specified Sony/Nikon, reflecting their close arrangements with sensor design, but there was no information as to what level product, such sensors might first appear. 19th It seems that there will be a D750 FF ‘sports’ camera from Nikon [NR] in time for Photokina. Whilst there was a brief ‘Nikon Medium Format’ flurry of chat last week, there seems to be nothing in it – see the Medium Format Rumours page for more, including the last time it appeared a few years ago. 25th D810 should be announced tomorrow. 17th The revised version of the D800 will be the D810 and announced towards the end of June. 6th We seem to be getting close to press announcements in the next few weeks. 13th New firmware for the D800/800E – quite a few changes – see D800 page for details. 23rd New firmware ‘C’ V1.01 for the D4S (Nikon EU) – Minor fixes. Look for similar updates as in the D4/D4s step. A class action lawsuit in California gets the green light, covering D600 Oil/Dust issues. The offer was initially in the US, but is worldwide [USA link]. Announcement next week, for March/April delivery. Nikon Corporation is preparing for the release of its next-generation flagship model, and has announced the development of the Nikon D4S HD-SLR. The camera will be on display, before its official release, at the Nikon booth (#14916, Central Hall) at the 2014 International CES show from January 7-10, 2014 in Las Vegas, Nevada. As Nikon’s new flagship model, the D4S will offer advances over the Nikon D4 HD-SLR camera, including enhanced image quality enabled with adoption of a new image-processing engine. The new HD-SLR will also feature more advanced autofocusing performance, further solidifying it as the choice for professional sports, nature and event photographers as well as photojournalists. The D4S represents a concentration of Nikon’s advanced camera development technologies and legacy as a leader in imaging. The D4S will further expand the possibilities for professional photographers who demand the best possible performance and image quality in challenging environments. The Nikon D4S will build upon the success of the acclaimed Nikon D4, a camera highly regarded for its speed, unrivaled low-light ability and amazing image quality that made it the choice of professionals and advanced amateurs around the world. 27th We’re told (thanks) that it’s a D4s that’s coming – much more of an update than entirely new model. 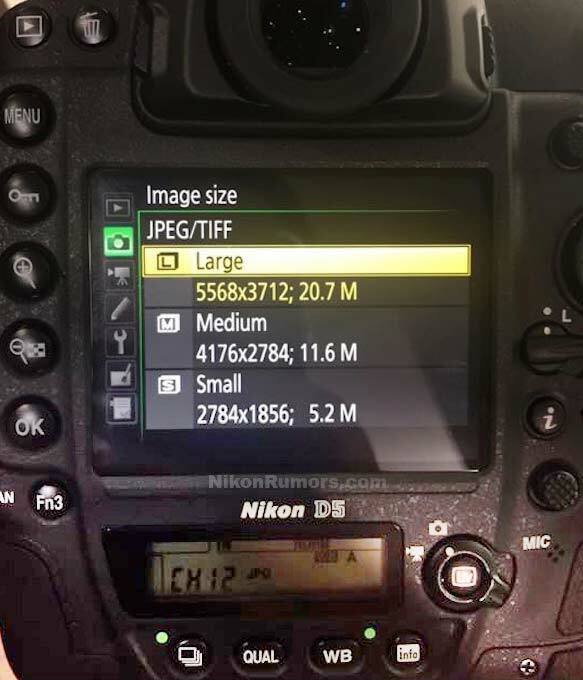 26th Seemingly, Nikon has stopped selling the D4 [NR] through their exchange program – something on its way soon? 19th At NR they report: “A new D4-like body is rumored to be already in production in Sendai. The Df production was apparently halted for two months, so they can “push” this new product before the Olympics”. 22nd The new Nikon ‘Hybrid’ camera rumour draws increasingly detailed specs. Timeframe is between a week and ‘months’, with 6th Nov suggested. 21st New Nikon FF mirrorless? What started as a full frame mirrorless rumour develops into something else. A D4x then later this year? Favourite for the D400 is still 24MP, but info has been sparse of late. Quite a jump in some areas, but overall probably not a huge leap – where does this leave space for a D400 in the lineup? 15th It seems there is likely to be a new Nikon lens rebate program in the US before long. I believe it’s from the Japanese ‘Impress’ magazine. Nikon D7200 probability is very high and it will arrive in 2013 with 39 point AF system and ISO range expandable up to 25600. Nikon D9000 – the rumored specification says newly developed sensor, 10fps continuous shooting speed and 51 point AF system. Nikon D4x is also expected to come on 2013. Dimensions: 141mm x 113mm x 82mm (5.5 x 4.4 x 3.2 in). 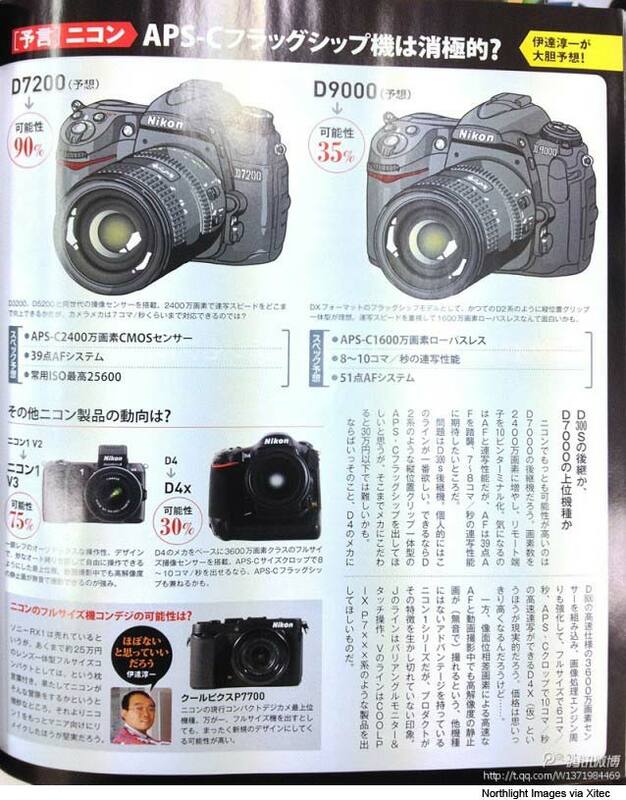 26th Some very vague D600 rumours are doing the rounds – not much other than cheaper, less MP, full frame and this year. 25th Important battery safety advisory for EN-EL15 batteries. The Nikon EN-EL15 battery is used in the Nikon D7000, D800, D800E and Nikon 1 V1 cameras. 18th The D3200 is due tomorrow 24 MP sensor, 11 AF points, 4 fps, ISO range: 100-6400, with max of 12800. This is likely the same sensor that will be tweaked for the long awaited D400. 4th Seems that a D4 article was accidentally released, for long enough to confirm the specs and $6000 price tag. 17th How abou a D4 shipping by the end of January? NR suggests an almost unheard of delivery schedule, given the camera hasn’t even been announced yet. 2nd No sign of any DSLR related announcements from Nikon, and Thom Hogan paints a fairly dismal picture [TH] of just what natural disasters have done to Nikon’s production this year. If the ’36MP D800′ ever was a real announcement, it’s likely to have been put back to next year, along with the (always IMHO) more likely D4. As part of this, it’s believed that Nikon are putting quite some effort into keeping details of what’s coming up as secret. 29th Some Nikon patent sightings [PB] – Anti dust and secondary mirror features – just the sort of things to appear in a D4? 23rd No FF Nikon DSLRs in October, according to a Swedish Nikon exec. Thom Hogan seems fairly sure that any D4 won’t ship until early next year, so there is no rush for an announcement. 22nd A suggestion that all there will be from Nikon are some Coolpix cameras [NR]. Just like the assorted Canon ‘rumours’, what once was a range of DSLRs and mirrorless seems to have been downgraded somewhat. 2nd The Nikon leak rate increases, with Nikon Rumors agreeing [NR] with Thom Hogan’s changes. 1st Thom Hogan modifies his predictions, upgrading the likelihood of a D800 (FF/’FX’) to come out with a D4 this month [TH]. D4x is pushed to late next year. 26th Nikon press events are scheduled for 24th August. More speculation from Thom Hogan [TH] puts a D4 and D400, announced in August, as what people will see. 3rd In expectation of new cameras and to show the relative ages of different models, I’ve added a Nikon Timeline below, and on the main rumour page. 29th When I had a Canon 60D for a while, I was struck by how useful the flip out screen was for some jobs. A Japanese magazine has drawings of what they suggest is the D4 and I see such a screen. If it’s for real, expect to hear a lot of anguish and wailing about it on forums – much along the ‘I don’t need live-view’ comments a few years ago. More realistic would be the comments I’m hearing of from some Nikon reps suggesting to pro users that they might like to hold off on D3s replacements for a while if they can. 26th Nikon have said their launch schedule is unaffected [NR] and a major Nikon announcement is supposedly due for the end of August. 3rd I note suggestions that the Nikon D4 will be pushed back to 2012 [1k1] and the D800 later this year. 13th From Japan we hear (thanks) that the D4 will push 4 key improvements for pro users. – Further flash system integration. No details other than they hoped I would consider it (?!?) as a ‘working pro photographer’. 7th A slew of compact cameras, but no DSLRs from Nikon at CP+ [NR] They are suggesting that FX camera announcements will be a summer event. 28th We hear (thanks) that the D4 is slated for an early Q2 announcement (April?). D4 at ‘around’ 20MP (FX ‘FF’ and HD vid). The same technology will appear in the (DX) ~18MP D400. The D4 should actually be released by the end of the Summer. As a follow on from what we were told this morning (above), a working pro photographer let us know that they had received ‘hints’ from a Nikon office to wait until August, when they enquired after buying several D3s cameras. Next year’s Olympics was also suggested as the next time for a new Nikon for the pro user. 20th Everyone’s expecting quite a lot of higher end announcements from Nikon this year, but so far the rumours have been pretty quiet. March seems to be a popular estimate for some news [NR] with both mirrorless and a D800 mentioned. Whilst I’m currently expecting the Canon 5D mk2 replacement – after- the 1Ds mk3 replacement, I’m minded to think we may not see a D700 replacement similarly delayed until after the D4 makes its entrance. 5th Thom Hogan makes his annual predictions [TH] for next year in digital cameras. The D3 was announced in August 2007 and D3s in October 2009, which is probably why most comments I’ve read put the D4 next year. Perhaps -after- the D4 appears next year? 25th Thom Hogan has some pointed comments [TH] about how (and why) Nikon service handles ‘gray’ imports so differently in the US and Europe when it comes to repairs and warranties. 17th Nikon web sites are down for maintenance today [NR] – maybe something new, but nothing in the larger DSLR area is expected. 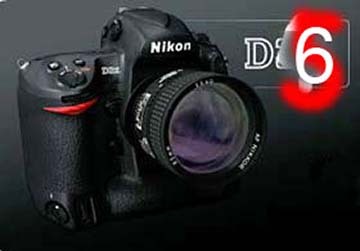 5th A photographer moving to Nikon kit is told pretty emphatically that the D700 replacement won’t be this year [NR]. Some time around March 2011 seems a pretty popular choice. 17th DPR reviews the D3s, and at the same time DxO produce some sensor specs. BTW these are always well worth a read. The D4 and D400 are still slated for a 2011 release – both expected to incluse a much revised AF system. Video @ 720p 24 fps. 9th Lots of Nikon events on the 14th, so expect to get D3x details early next week. 6th A D4 early next year? One 1D3 owner moving to a D3 (yes it happens ;-) was told by (someone at) Nikon that the D4 would appear early next year. The D3s seems to have taken the lead [PPH] expecting something in October. More info [NR] now puts this almost as a given (15th? ), although specs seem a little difficult to pin down. Nikon D3s with ISO 200-12800 (D3 was with ISO 200-6400). New ISO range HI-3 at 102,400 ISO. 12.1 mp FX sensor (same as the D3, but tweaked). As widely expected a D300s and D3000 are announced. Specs etc at DPR. At NR, we have a purported Nikon product roadmap. Some features of the excellent D3 do look a little behind the times, and as such a D3 update is suggested by many in the Autumn [NR]. A few more MP and a dust removal system seem quite likely. D3s and D3h seem popular names, based on previous models. This is not a Photokina year, so there are less constraints on announcement timing. We had a flurry of interest from Nikon last year, asking us to try their kit. Despite repeatedly saying ‘Yes Please’, nothing ever materialised :-( This is a pity, since I’d love to do a comparison with some of the top notch lenses now coming to market. 13th The D300S looks to be taken as a given by many. A possible sreen shot at [NR] There is a suggestion of a histogram zoom option, which could be very useful for tricky lighting and some HDR work. D400 stories seem to be on the increase, including comments that the D300 is soon to be discontinued. Most obvious feature is the articulating screen, which I guess we can expect to see in the more DSLRs now. 12th An announcement next week? Nikon Europe web sites seem to be down – probably for the announcement on the 14th. March 28th Some specific Nikon web site areas for the D40 and D300 have vanished. In the past this has been a prelude to new models. “Nikon D400: An ideal compromise. The D400 DSLR is a great compromise between price and quality. The new camera is meant to replace the last year’s popular D300, a camera which can be fully appreciated not only by amateurs, but also many professionals. The D400 specifications fully meet the requirements for modern mid-range priced cameras. A 14.3 Megapixel CMOS matrix is used in this camera, with an ISO range of 100 to 6400 and a 7 frame-per-second capability. An interesting feature of this new camera is the ability to shoot video at 1080p and 24fps. All of this makes the D400 not only a great picture camera, but also not too bad of a video camera. For media storage, CF/UDMA cards are used. The camera is equipped with a liquid crystal display with a diagonal of 3.5in and a resolution of 922,000 pixels. The LCD is able to dynamically adjust the brightness and color following a change in ambient lighting, thus providing an accurate representation. The safety of the optical and electronic components is assured through the use of a magnesium alloy frame. Rubber gaskets are used for each button to prevent moisture from entering the case. 26th A collection of Nikon (and other) camera predictions from a Korean site. 7th 24MP D800 for August? Picture Controls streamline in-camera image processing by enabling customization of image parameters before capture and offer complete control over sharpening, contrast, brightness, hue and saturation in various colour modes. 17th D3x on the 1st of December? [DPR] 24MP and a weak AA filter? Something not called a D3x: probably announced in late 2008, but certainly announced in early 2009 and shipped by the March timeframe. Thom is also not afraid of making predictions, so for a good discussion of what’s expected and what he got right last year, see his 2008 predictions.. There is also a supposed YT video.